Central Air Conditioner Blowing Hot Air? A Glendale, AZ Tech Explains. We’ll explain all the problems you can fix yourself and what requires a tech’s touch. 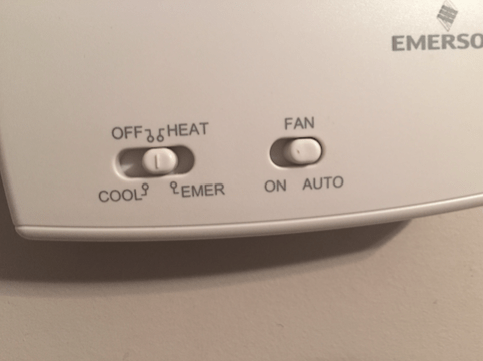 Is your thermostat set to “ON” or “AUTO”? If the fan setting is set to “ON”, that may be the problem. 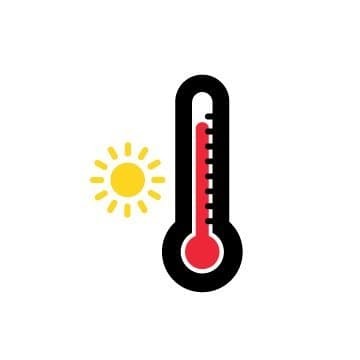 The thermostat’s fan setting controls the air conditioner’s blower, the part that circulates air throughout your home. When set to AUTO, the blower only works when the system is actually cooling the air. When set to ON, the blower works 24/7—regardless of whether the air is being cooled. And when the blower circulates air when your system isn’t cooling, the air will feel warm. Do this: Check your thermostat and make sure it’s set to AUTO. Is the outside unit dirty or covered by anything? Go to the outdoor air conditioner unit and give it a look over. Covered by a low hanging branch? Surrounded closely by a fence? If any of the above are true, this may be your problem as the outside unit needs to be free of debris for your AC to properly cool your air. To understand why, you need a basic understanding of how your AC system works. The indoor unit (evaporator) uses refrigerant (a heat transfer fluid) to absorb heat from your home’s air. 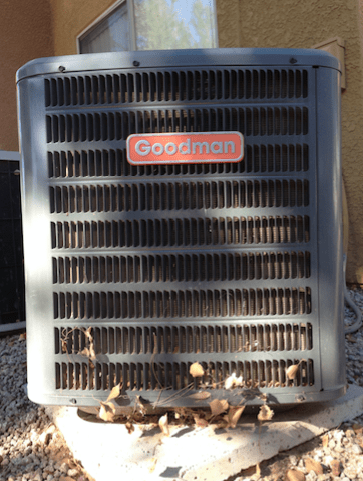 The outside unit (condenser) releases that heat outside. Now, imagine that you have a regular sponge that absorbs a lot of water, but you don’t squeeze that water out. The sponge can’t absorb any more water, right? Now apply that logic to an air conditioner as a heat sponge. If your AC can’t release the heat, it can’t absorb any more heat from your air. And therefore your home’s air stays warm. And that’s exactly what happens when the outside AC unit is dirty or covered—it can’t release heat and therefore can’t cool your air. ....then you may have found the problem. 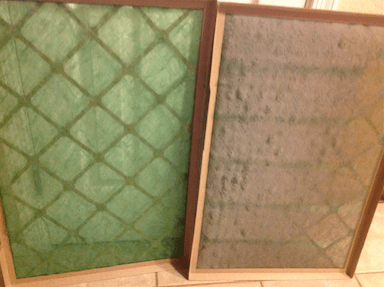 Why would a dirty filter cause your AC to blow warm air? Essentially, it can cause your AC to overheat and shut down the outside unit while the inside blower keeps working and blows hot air. Let’s explain that in more detail. This means the AC is “air starved” and therefore cannot put out enough cold air to meet your desired temperature. This air starvation causes the AC’s compressor (the “heart” of your system) in the outside unit to run continuously until it overheats, trips the circuit breaker, and shuts down. Now the outside unit isn’t working, but the inside blower is. Meaning your system can still deliver air, it just won’t be cold. Do this: Change the filter if it’s dirty. Going forward, make sure to check the filter once a month and change it as needed. Is the breaker tripped? Is the fuse blown? 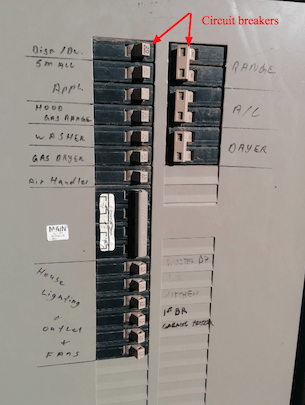 If the switch has tripped (moved to a neutral position) or the fuse has blown, you may have found why the outside unit won’t turn on. The tripped breaker means there’s no power going to your air conditioner’s outdoor unit and therefore your system cannot work properly to cool down your air. If you’ve changed the air filter and cleaned the outside unit, you may have also solved the reason why the breaker tripped in the first place. Do this: Reset the switch or change the fuse. If the switch does not stay ON or trips again, don’t reset it. That means you have a problem elsewhere that a technician will need to fix. The same goes for a fuse: if it blows soon after you replace it, you have an issue elsewhere. If you’ve done all the above and that didn’t solve the problem, you’ve exhausted your DIY options and will need to call a pro. If you live around the Phoenix Metro area, Patrick Riley pros can help! Our techs do whatever it takes to fix your AC and get it good as new—no matter how old it is! Schedule an AC repair today.